Often times, ports of classic arcade titles either include nothing that updates the game or change the game so much that the fun of the original is lost. Ms. Pac-Man for the Genesis does an excellent job of recreating the arcade experience at home while adding several new options that make the game an upgrade over the original. The game features 4 sets of mazes; the original arcade set, a set of smaller “mini” mazes, a set slightly larger than the original, and a set called “strange” that uses more complicated layouts with longer passages that are easier to get caught in. The game also features 4 “difficulty” settings, but they are in reality just game speed settings. 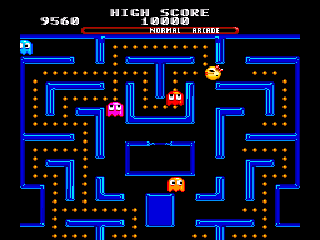 With the game speed set to normal and the arcade maze set used, Ms. Pac-Man on the Genesis closely recreates the gameplay of the arcade original. The new mazes are a welcome addition that add some variety to the game but do nothing to change the core gameplay. One new addition that does tweak the game is the optional “Pac Booster” which serves as a kind of “turbo boost”, allowing Ms. Pac-Man to zoom around the maze at a higher speed when a button is pressed. While this is fun to play with, it definitely makes the game easier by giving the player a distinct advantage, serving as a bit of a crutch for those not proficient with maze games. The game also features a 2-player simultaneous mode, but due to the manner in which the play field scrolls up and down it is not always possible for both players to see their respective characters on the screen. The graphics have been updated to give the game more of a 16-bit look, with additional shading and more colorful sprites being used while maintaining the visual style of the original game. The sound effects have been improved slightly which is certainly a welcome change, but the music has remained the same with the familiar tune played at the beginning of each level and during the still-present cut scenes. If you’ve never been fond of the series then this game isn’t going to change your opinion, but this is a great update to Ms. Pac-Man that will be enjoyed by anyone who is a fan of the series or of classic arcade games in general. Buy Ms. Pac-Man on GameGavel or Amazon. Tagged Arcade, genesis, Mc. Pac-Man, Review, sega. Bookmark the permalink.